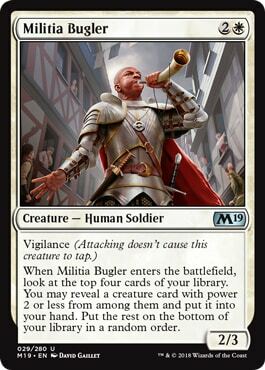 Ever since its release in Core Set 2019, Militia Bugler has been recognized as a card with a ton of potential. Being able to potentially find another creature from your deck while also acting as veritable threat makes the Bugler a card that's worth playing. This week I have for you a trio of decks featuring Militia Bugler that all have a ton of potential. Let's get started. While Militia Bugler may not be a Knight himself, he does play well with a bunch of the Knights currently in Standard. The first deck I have for you this week uses Militia Bugler as a way to bolster your company of Knights. Let's take a look at it. One thing to mention right away is the fact that this deck includes a full playset of Orzhov Guildgates. Since it was created on March 6, 2019, I have to assume that is intentional. However, in my opinion if I were to sleeve this deck up today to play, I would substitute four Godless Shrine for the four Orzhov Guildgates. That way if I drew a Godless Shrine and didn't need it for mana production that turn, I could always play it tapped, but with a Guildgate that always comes into play tapped, I could draw one when I needed a land that could produce mana that turn which could cause me to lose the game. Militia Bugler has a lot of potential targets to find in this deck. While it might be easy to choose Knight of Grace or Knight of Malice if they are in the cards you get to look at when Militia Bugler enters the battlefield, the best option to choose will often be Ravenous Chupacabra. Ravenous Chupacabra has not seen a ton of play lately, but like Militia Bugler, it acts as both a creature and a spell when it enters the battlefield. It's a great card to hold onto until you find yourself facing a threat that you can't deal with otherwise. On the other hand, if you do decide to get one of those Knights when Militia Bugler comes into play, that choice can really pay off once you're able to cast Valiant Knight. Not only does Valiant Knight give a +1/+1 boost to all of your other Knights in play, but it also allows you the ability to give all of your Knights (including itself) double strike. Attacking while leaving five mana available gives you the "threat of activation" that can make combat a real nightmare for your opponent. They'll either need to block with their creatures which will likely end up in them dying or take double damage if your creatures hit unblocked. Alternatively, if they choose not to block, you can simply hit them for normal damage and use that five mana to cast other threats that will make their choices that much more difficult next turn. One other cool card in this deck is Sigiled Sword of Valeron. Equipping one of your Knights with first strike with this sword feels great. Not only does it provide a +2/+0 bonus, but it also provides vigilance and creates a 2/2 Knight token that's also attacking. In addition, this sword makes the creature it's equipped to a Knight in addition to its other types, so it will gain the +1/+1 bonus from Valiant Knight if it didn't otherwise have it. Sigiled Sword of Valeron is a great addition to any deck that features a Knight theme but also runs some non-Knight cards as well. The next deck I have for you features Militia Bugler alongside some great Black and Blue threats. Let's have a look. Both Hostage Taker and Kitesail Freebooter are great choices you can get when you play Militia Bugler. With Hostage Taker, you'll be able to remove any creature your opponent has in play for as long as you can keep Hostage Taker alive. Then, to add insult to injury, you can also choose to cast that creature and bring it over to your side if you want to. Hostage Taker can do the same thing with artifacts, so if your opponent doesn't have any creatures you want to steal, be on the lookout for any Treasure Maps they might have in play. Kitesail Freebooter also disrupts your opponent's plans by allowing you to take any noncreature, nonland card from their hand and deny them access to it for as long as the Freebooter remains in play. One thing to keep in mind is that Kitesail Freebooter has flying, so as long as you're able to keep the skies clear with Hostage Taker, Kitesail Freebooter will be able to attack with impunity. You'll also want to keep the skies clear for Thief of Sanity. If your opponent wasn't happy that you're able to cast one of their creatures via Hostage Taker, Thief of Sanity will almost certainly put them on tilt. I can say from experience that it is very frustrating to play against a deck that uses my own cards against me. That's exactly what this deck is trying to accomplish, so if you're a fan of giving your opponent this type of grief, then this deck is for you. Speaking of feeling grief, this deck includes another grief-inducing card, Tithe Taker. With a single copy of Tithe Taker on the battlefield, all of your opponent’s spells they cast on your turn will cost an additional mana to cast. All of their activated abilities also cost an additional mana as well, so cards that can adapt are less threatening as blockers. If you manage to get multiple copies of Tithe Taker into play, the effects will stack as well. The final deck I have for you is a Bant deck that features an assortment of creatures with a variety of abilities that happen when they enter the battlefield. Let's take a look at it. In this deck, a key creature you'll want to be on the search for with Militia Bugler is Prime Speaker Vannifar. Once you have Prime Speaker Vannifar in play, you'll have a ton of options available to you. Before playing this deck, or any deck with Prime Speaker Vannifar in it, I recommend becoming very familiar with all of the creatures in your deck and where they fall on your mana curve. That familiarity you gain will allow you to know what abilities are available to you if you decide to activate Prime Speaker Vannifar and sacrifice one of your creatures. There's no worse feeling that sacrificing a creature only to search your deck to find that you either have nothing that you can put into play or that the creature you find doesn't advance your plans. While this deck mainly features a bunch of 1-of's and 2-of's, it does feature a full playset of both Militia Bugler and Knight of Autumn. Hopefully by now, you understand the need for the full set of Buglers. Knight of Autumn is included as a 4-of because of the versatility it offers. If you're facing an aggressive burn deck, gaining four life while putting a blocker into play can keep you in a game you would otherwise lose quickly. Being able to destroy an enchantment like Curious Obsession when playing against a mono-Blue tempo deck can allow you to keep an opponent from drawing valuable counters when they need them. Finally, putting two +1/+1 counters on Knight of Autumn is a great default choice, as it's never a bad thing to get a 4/3 creature for 3 mana. Anyone that knows me knows that I'm all about getting value from my investment. Militia Bugler provides a ton of value and fits well into a variety of decks. Do you have a favorite deck featuring Militia Bugler?